"Quiet, peaceful & staff were very helpful"
The hotel is centrally located in the most beautiful part of Szeged, on the banks of the Tisza River, close to the Chatedral of Szeged (2 km). The spacious, air-conditioned rooms with a beautiful panorama to the river Tisza feature a balcony, free Wi-Fi access, 33 International Tv channels( on-demand movie system), minibar, in room safe and tea/coffee facility as well. Children under age of 16 (maximum 2 per room) can stay free of charge in the parents room. For their pleasure we set up a children’s corner with X-box game console and further toys. 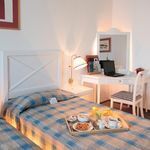 Beyond these services the hotel features a Café Tisza restaurant with International and local dishes, a lobby bar with pool table and parking facilities too. Our 5 meeting rooms offer an ideal location for events, conferences and weddings up till 220 people. The city of Szeged and its surroundings offer wide range of sport and cultural activities, like Zoo Park, Thermal spas both in Szeged and in the neighbouring towns. New reservation 10 minute(s) ago! The rating of Novotel Hotel Szeged is 9.3 from the maximum 10, 1910 based on actual and valid guest ratings and reviews. "A gyermekem kis meglepetést kapott bejelentkezéskor. Személyzet nagyon kedves."